12V accessory power for your devices - running stealthily inside your glovebox. Uses stock flashlight connector port - white or black flashlight models available. 100% Plug & Play. Two models available for each 80s/90s and 90s/2000s BMWs. ​dash panel with no wire splicing or modifications. We got tired of our feet slipping off the stock pedal pads and designed an grippier alternative out of 100% natural rubber with a sandblasted micro texture. Fits many BMW models across many years. 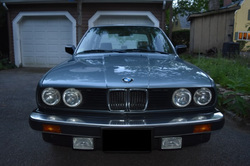 ​​Older BMW mirrors often vibrate due to worn mounts, driveline vibrations or musical frequencies. Our professionally manufactured mount eliminates vibrations appearing in the mirror field and saves your sanity - once and for all. Are your original seats worn out like everyone else's? Replace your worn out original seats with custom rebuilt seats to match your OEM interior. Each E30 is one of a kind. At this point, many cars are 30 years old and 200K miles. Each car is an expression of its owner and reflects their personality. Mine has a name - 'Greta'. Maybe yours does too? E30Love.com offers unique E30 and general BMW related items directly to you from the makers and craftsmen who design and use them every day.